UPDATED: (Nov 4, 2013 at 8:59 pm): Galloway Police have released Driver and Occupant Information. See below for the the Update. 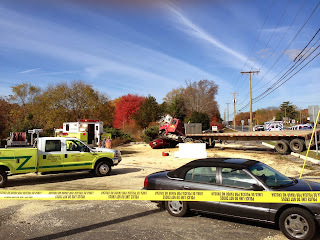 Preliminarily it appears that the Driver, 23 of Seabrook, NJ of a tractor trailer traveling Westbound on Rt. 30 failed to obey the red traffic signal at the intersection and collided with two (2) vehicles that were headed South on Pomona Rd. Subsequent to colliding with those two (2) vehicles, the tractor trailer veered into the Eastbound lanes of travel on Rt. 30 while still traveling westbound and drove over top of a 3rd vehicle. The 3rd vehicle overturned and became pinned underneath the tractor-trailer and both vehicles then continued into the South West ravine off the roadway. The occupants of the 3rd vehicle had to be extricated from the vehicle. 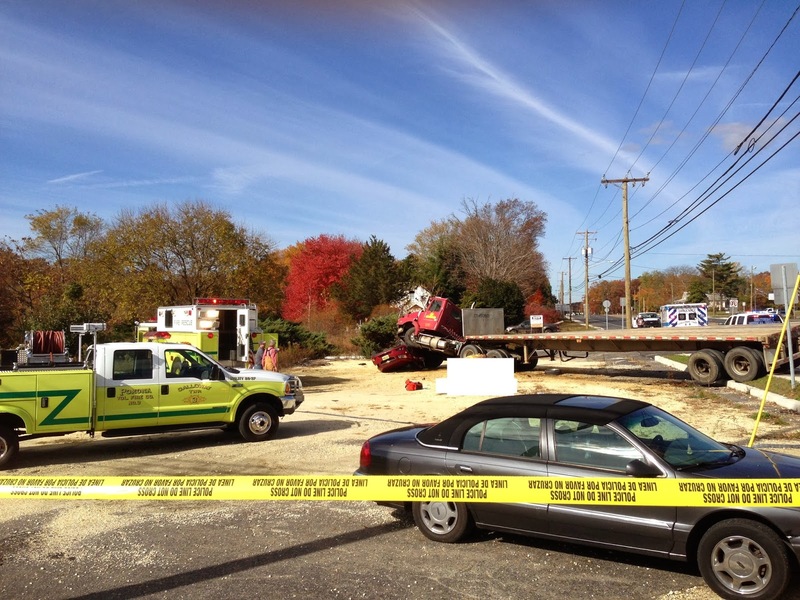 Seven (7) people were injured and transported to 2 area hospitals via ambulance ground transport and medi-vac personnel. Driver of the 3rd vehicle, 69 year old male of Hammonton, NJ later died at the hospital. The Atlantic County Strike Force was activated including ambulance crews from Galloway, Absecon, Hamilton Township, Atlantic Care Regional Medical Center and Shore Memorial. Pomona Fire Department, Germania Fire Department and Bayview Fire Department as well as South-Star medi-vac and Penn-Star medi-vac personnel assisted at the scene. Officers Steven Garrison and Patrick Neal of the Galloway Twp. Police Accident Reconstruction Unit are investigating. Galloway Police was assisted by: New Jersey State Police, Atlantic County Prosecutors Office, Stockton College Police and Hamilton Twp. Police. According to Police, no summons have been issued at this time, although Police anticipate charges to be filed. Name will be released tonight. Courtesy of Galloway Now, Click HERE to listen to the EMS & Fire Radio Transmission, starting from 10:45 a.m. The driver of the Tundra, is an off duty Galloway Township Police officer, and reported the accident on his cell phone before exiting his vehicle and rendering aid to the occupants of the other vehicles. Brenner was treated and released from the hospital with minor injuries, according to Police. A tractor trailer, occupied by the driver Greg Hoover (23y/o) of Seabrook, NJ, and a passenger Amberline Faison (22 y/o) of Bridgeton, was traveling west on Rt. 30 and failed to obey a red traffic signal at Pomona Rd. The tractor trailer then struck a Toyota Tundra, operated by Gary Brenner (36y/o) of Galloway, as he was traveling south on Pomona Rd. The tractor trailer then struck a second vehicle traveling south on Pomona Rd. That vehicle, a Mercedes Benz, was occupied by the driver, Robert Bozzuto (60 y/o) and his passenger Sandra Nilan (71y/o), both of Galloway. The tractor trailer then struck a Chevy Cruze, occupied by the driver William Anthony Jr. (69 y/o), front passenger Joyce Anthony (66 y/o), and rear passenger William Anthony 3rd (41 y/o), all from Hammonton, NJ. The Chevy Cruze overturned and was pinned under the tractor trailer. The occupants of the Mercedes Benz were taken to Mainland Division, current status unknown. 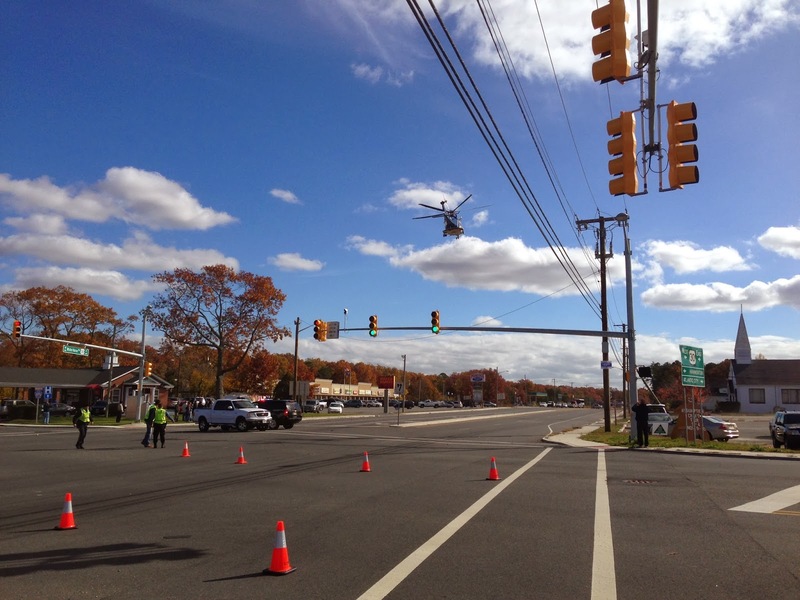 The intersection was closed to traffic for approximately 5 hours with the assistance of NJ DOT while the scene was investigated. Any charges are pending the completion of the investigation.